A men's white gold figaro chain is a classic piece of jewelry and perfect for many occasions. Chains are one of the most traditional forms of jewelry for men. Many ancient civilizations regarded chains of all descriptions as being an important form of body adornment and examples of chains can be found in many museums and collections of ancient jewelry. In more recent times, chains have been seen as a sign of status within a community. Mayors, for instance, and others in high office wear chains to show their authority. Chains today, however, are much more widely worn and are regarded as a fine piece of jewelry for both men and women. Gold chains are a popular choice, gold is attractive and is very hard wearing. Gold looks wonderful against many different skin tones. Unlike silver, it does not tarnish or leave a patina on the skin. Gold is also extremely valuable, although gold plate, hollow chains and gold fill chains are all good lower cost alternatives and are ideal when budgets are tight. Gold is available in many different shades and karats, with yellow, white, red and green gold being popular choices. One of the most fashionable shades of gold for men is white gold. This has all the qualities of standard yellow gold, however with a bright white metallic finish. White gold goes well with a variety of other jewelry types and works perfectly with jeans and a t-shirt or a posh suit. An interesting and distinctive type of men's white gold chain is the figaro chain. 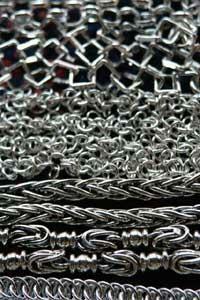 This type of chain is recognized by the formation of chain links. Rather than every link being a standard size and shape, the figaro chain is formed from two or three small round chain links with one long oval shaped link. This gives a bit of added interest to the chain without compromising on the strength of the chain. This makes a figaro chain ideal for active men who want a chain that is suitable for a more robust lifestyle. Men's white gold figaro chains are available in a wide range of thicknesses and lengths. Thick chains make a striking statement and thinner chains are more subtle. The type of chain will depend largely on choice. Chains for men are often shorter than chains for women and sit closely around the neck which makes them ideal for wearing with a variety of outfits. Custom made chains are also a great option for a one of a kind piece of jewelry. When buying a piece of jewelry such as a white gold figaro chain for a man it is useful to inquire whether the store has a return policy. This means that if the chain is not quite right, it can be taken back and exchanged. This will ensure that rather than owning a chain that doesn't get worn, a chain will be given which will be much loved and cherished. Check the type of clasp and ensure that it suits the chain. Large chunky chains look better with a complementary clasp. Very fine clasps will look out of place and also may not be strong enough for a large heavy chain. There are many different types of clasps available, and bolt clasps are a good and reliable choice that look great with figaro chains. Make sure the chain is stamped or hallmarked. White gold can look similar to silver and often, to the untrained eye, they can get confused. When parting with a lot of money for a white gold chain it is important to ensure that you are getting what you pay for! A white gold figaro chain is a perfect item of jewelry for a man and one that will become a treasured item of jewelry and be cherished for many years to come.